Look what came in the mail the other day, a hand-stitched leather brooch from Belgium! This came from the lovely Sandrine, who is a super crafty gal. I was really happy to hear from Sandrine, who suggested a swap for this laser engraved brooch I made. This is my first swap, how fun! Merci beaucoup, Sandrine! I love it and look at the perfectly matched outfit I was wearing the day that it arrived. 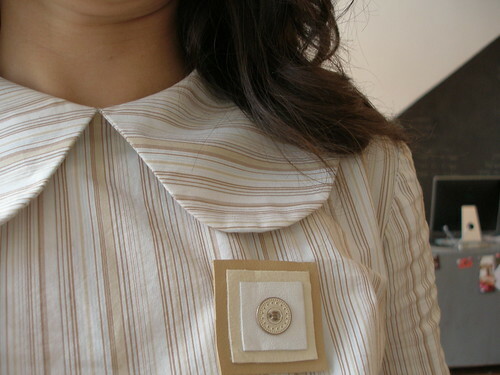 I have been collecting photos of people and their brooches. I feel like the brooch has made a really good comeback in the last year and I love seeing all the different ones that people have. It is such a great way to wear a little piece of crafty goodness. I saw this post this morning and took it as a sign that I should order the brooch I’d had my eye on this week. So I did (only $14, and so unique, I think)! I went overboard with brooches a few years ago (culminating with the purchase of a HUGE rhinestone number from H&M that people had to shield their eyes from) but I’m so happy to go back to them now. Ooo lovely brooches – both of them! oh anabela – i feel like i could just copy everything you do! (okay, i admit, i kinda do) that brooch is amazing and well priced. definitely a MUST HAVE. becky – thanks! though sandrine deserves more credit for mine, as all i did was open up the envelope and receive it! i the collars of your dress, karyn! i would like to claim broochiest workroom visitor as evidenced by your photoset. wait till you see the chest candy i have to flaunt from my travels. that was horrible. nobody should call brooches ‘chest candy.’ i’m sorry. also, that other becky is not me. sandrine – you’re too cute! i’m honored to have your lovely brooch. let me know when you receive my package! melissa – sometimes i feel like that collar makes me look 5 years old. becky – (of sweetie pie press fame) i’ve fallen off my brooch bandwagon lately, but hope to pick it back up for fall, so get your collection ready. ooh I agree I adore brooches and went through a phase of wearing as many as possible in one go! I love Sandrine’s brooch, the colours are lovely.